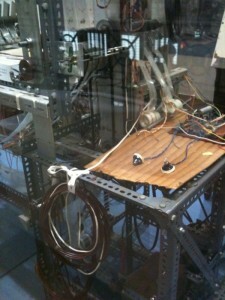 In early November I visited the Science Museum in London, to see the Oramics exhibit. Oramics is a musical technique developed by Daphne Oram in the late 1950s, while she worked for the BBC Radiophonic Workshop. The idea is based on the concept of depicting sound as graphs (where you can see, for example, how the amplitude of the graph gets bigger as the sound gets louder. I use that feature of Garageband to help me edit the interviews I’ve posted). Daphne Oram thought that if you can turn sound into a graph, you should also be able to start with the graph and turn that into sound. She created the Oramics Machine, which did exactly that. As input it used film strips, on which Daphne had painted graphs and shapes. The shapes she drew were interpreted by the machine, and converted into sound. The museum exhibit not only had the original Oramics machine on display (shown above) but also an interactive digital replica, where you could draw shapes and modify graphs, and hear the sounds change. You can’t hear the sound very well in the video, because it was coming from headphones. After starting a study in electrotheraphy, Daphne was offered a place at the Royal College of Music, but instead she chose to combine the fields of electronics and music, and took a job as music engineer for the BBC. She was involved in the creation of the Radiophonic Workshop, but left a year after its inception to set up her own studio. Can digital lab notebooks protect against fraud?